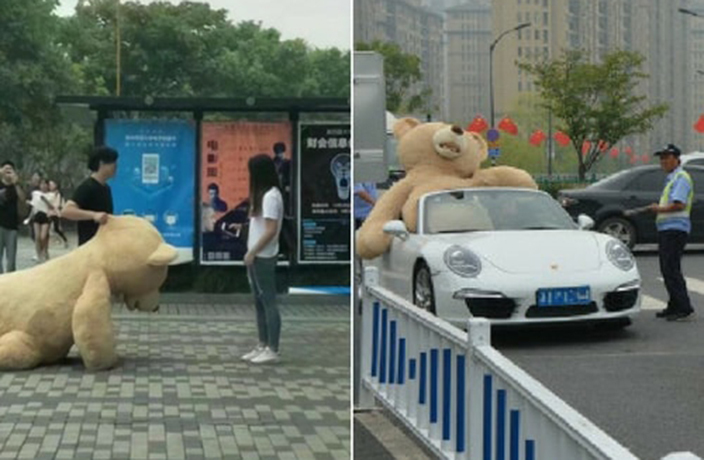 In a ploy to impress the object of his affection, a student at Hangzhou Normal University bought an eight-foot-tall teddy bear, stuffed it into the back of his Porsche and drove it to the university campus, reports What's on Weibo. It lolled out of his convertable porsche, which looked like a toy car compared to the oversized bear. His fellow students immediately snapped pictures of the strange sight and posted them on Weibo. The student lugged the teddy bear out of the car to present it to the girl he liked, but was she impressed? Not in the least, it seems. She not only rejected him, but also kept the stuffed bear. While many netizens had a good laugh about it, some saw the stunt as nothing more than an elaborate marketing campaign for Costco, an American warehouse giant with branches in Asia that sells the bear. It just so happens that Costco earlier this month announced it would be opening its first China outlet in Shanghai soon. Hmm... coincidence? Still others saw it as an example of fu'erdai extravagance. Giant teddy bears are popular with the children of the Chinese nouveau riche. According to What's on Weibo, there are only three of these gigantic stuffed bears from Costco left in mainland China, but Taobao offers similar products for about RMB800-900 (USD$120-136). When it came to taking a chance on love, RMB900 was a small (but humiliating) price to pay for this student. Authorities believe the incident was the result of a less-than-healthy relationship between the boy’s parents. Get your summer break on with these awesome kids toys from NERF, now on sale! According to statistics released by Eleme, Shenzhen enjoys a greater proportion of nighttime food deliveries than any other Chinese city. It turns out money really doesn't buy happiness. He hopes to find a partner before he turns 70.